FT. LAUDERDALE, Fla. Four high school baseball players visiting Florida on Spring Break have an amazing fish story to tell back home in Georgia: They hooked a 13-foot-long Great White shark while sportfishing. On Tuesday the four teenagers were part of an excursion on the charter boat Hooked Up out of Fort Lauderdale. Captain Greg McCauley told CBS Station WFOR that the Great White, which he estimated to weigh between 800 and 1,000 pounds, took a bonito off a kite line about 180 feet from the Port Everglades Inlet -- about a mile off shore. Harry Andros, Josh Shailer, and Logan and Tanner Elliot, who play baseball in Dunwoody, Ga., and the Elliots' dad Jared, fought the shark for two hours before they were able to get it close enough to the boat to see what they had. That's when they all realized it was a Great White -- a rarity in Florida waters, at least until recently. The four teens kept trading off tackling the giant fish. "We could only go for just five minutes each, 'cause we'd just get tired, and then we'd switch off," Andros told WFOR. 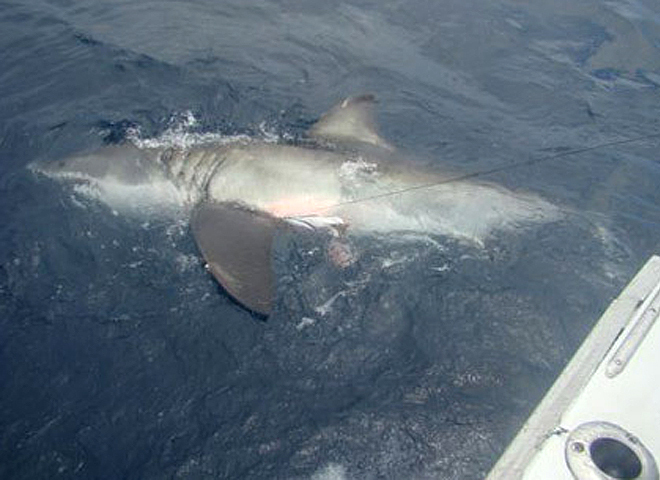 After they were able to get it close to the boat, the shark was photographed and then released in good shape. Several beaches have closed over the past month as black tip, lemon and hammerhead sharks have been spotted heading North on their annual migration, CBS Station WFOR reports. Capt. Taco Perez, whose Taco's Hooked Up Sportfishing owns the charter boat, told WFOR he heard from a fellow charter boat captain in Miami-Dade that a Great White was hooked off Key Biscayne a few days ago, and another was recently spotted off Jacksonville.